A Very Small Aperture Terminal (VSAT) is a device - known as a small private earth station - that is used to transmit & receive data signal through a satellite. The "very small" component of the VSAT acronym refers to the size of the VSAT dish antenna -typically about 4 feet (1.2 m) diameter- that is mounted on a roof, or placed on the ground. This antenna, along with the attached low-noise converter (LNB-which receives satellite signals) and the transmitter (BUC-which transmits the radio waves signals) make up the VSAT outdoor unit (ODU), one of the two components of a VSAT earth station. The satellite modem which makes the connection between the computer is named the indoor unit (IDU) and does all management of that small private low cost earth station. The connection is quite similar in terms of speed to an ADSL connection. Sometimes referred to as Sat adsl or Satdsl or even dslSat. GlobalTT as a Professional Internet Service Provider, offers internet and telephony services directed towards all types of users from end-users to ISP's and Telco's throughout the various coverage areas of the satellites (see our satellite coverage). Current Services include TDMA Dama telephony service and internet over many DVB (digital transmission) out over various satellites. GlobalTT works mainly with a very large network of authorized and qualified distributors for all the areas and countries covered by our satellites. is installed every 3 hours. 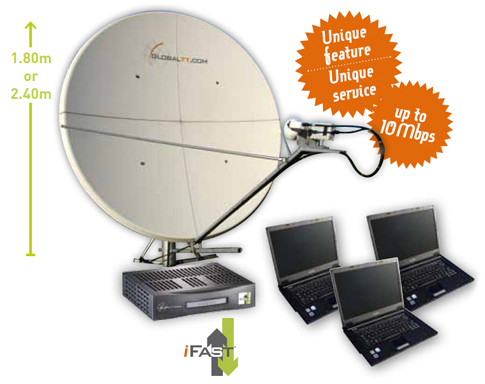 GlobalTToffers a two way Point-to-Multipoint (P2MP) service. It combines state of the art VSAT technology with unparalleled QOS, service, 24/7 control. GlobalTT enables customers to connect remote operations/office directly to their head offices via Internet in full star or full mesh single hop (unique feature and service). Multiple locations may be connected in a star IP or Voice and mesh single-hop, voice, data, e-mail and Intranet applications. Expertise GlobalTT offers a range of managed services that combine its unrivalled technical expertise and field experience, helping customers to take full advantage of the diverse opportunities afforded by our private earth station, our backbone connectivity in Belgium and our satellite fleet. GlobalTT has been present on the telecom market for over 20 years.